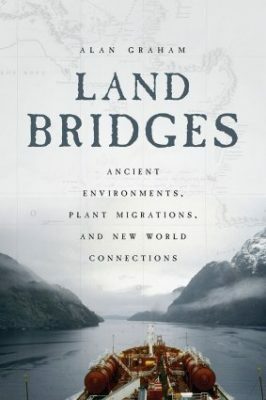 Land Bridges: Ancient environmental plant migrations, and New World connections by Alan Graham 2018. University of Chicago Press. Why are the Earth’s terrestrial organisms found where they are? This is a simple enough question. However, trying to trace the full story of the present-day distribution of organisms – their biogeography – is tricky; the patterns present nowadays have probably taken as long to establish as has the evolution of the organism under consideration. Plus, some of the paths that may have been exploited by organisms in the past may no longer be present today. Trying to infer the actual routes taken therefore involves a lot of detective work, and the bringing together of many disparate scientific disciplines to construct a sensible narrative. One such route exploited by migrating biota in days long gone is the land bridge [LB] *. Land bridges have the potential to facilitate the movement and exchange of species between the Earth’s land-based living spaces. Although human and non-human animals may be the more obvious biota that capitalise upon these physical terrestrial connections, the mass migrations of plants via these routes are as important – and maybe even more profound – than those of non-human animals from an ecological point of view. In seeking to draw our attention to the plant-related dimension of these translocation super highways, Alan Graham has produced Land Bridges: Ancient environments, plant migrations, and New World connections [hereafter referred to as Land Bridges]. In Land Bridges **, Graham considers in detail five such connections that have helped to create the natural background to the New World, especially its flora, over a period of approx. 100 millions of years of Earth’s history. To the north we have the boreal pathways of the Beringia LB (which connected Asia and northern America) and the North Atlantic LB (uniting North America and north-western Europe via Greenland and Iceland), in the middle of the Americas we have the equatorial connections of the Antillean LB, and the Central American LB (both providing exchange routes between North and South America), and at the bottom of South America is the Magellan LB (which provided a transport route between Antarctica and South America). And as most of the LBs disappeared geological ages ago, the organisms became trapped in their new homes, and either prospered – or, at least persisted – or perished. For each of the LBs Graham has amassed and presented a wealth of evidence that gives important information about the geographic setting and climate, geology, modern vegetation, utilization of the LB, indigenous peoples, and the peopling of the Americas. Accordingly, in Land Bridges Graham considers not only the millions of years old natural events, but also the important part played by human activity in millennia long gone by that have influenced the present-day New World biota. However, land bridges are not the ‘free-for-all’ one might imagine them to be, permitting unfettered two-way movement of biota; most New World LBs had narrow regions at either end, and therefore acted as filters, constraining and restricting what ultimately moved along the bridge. As should be expected from such a text, there are abundant references to support the tale told by the author, which are cited in-text and listed at the end of each chapter. One of the most useful chapters in the book is chapter 8, which summarises the preceding 300 pages (though this is no substitute for the details in those other pages! ), and presents the author’s conclusions. Arguably, one of the most important of Graham’s conclusions is that, as important as the land bridges have been, climate emerges as a powerful factor in regulating migrations. This finding is therefore not only of historical relevance to the biogeography we have today, but also a reminder of what may happen in future to the distribution of plants (and animals…) as climate concerns continue and the future of the Earth’s biota occupy humanity’s thoughts at the present time. Land Bridges is very readable, and well-written with what I understand to have become the author’s personal style – which includes ‘asides’ and anecdotes. Those aspect of his writing are given due consideration – and defended – by the author on p. xxi of the Preface. This book is therefore another example of the freedom that the publisher, University of Chicago Press, allows its authors. And it is most refreshing to see; it helps to enliven what could otherwise be a much duller contribution (and is reminiscent of the style I first encountered when reviewing Armstrong’s How the Earth turned green). Alan Graham hasn’t discovered land bridges, but he has created a work of great scholarship that seeks to place before us all the importance of these geologically somewhat short-lived features, particularly their relevance to plant distributions in the Americas. Part natural history, part human history, part gazetteer of geography, Land Bridges is a fascinating read. Weaving together many different strands of study, Land Bridges is a most impressive achievement. * And let’s not overlook the fact that land bridges are not just historical, no-longer-present phenomena. Some still persist today, e.g. that between North and South America that provides a transport conduit between those two great land masses – unless and until any wall is constructed between the USA and Mexico [Robert Peters et al., BioScience, biy063, https://doi.org/10.1093/biosci/biy063]. And there are new bridges nowadays which didn’t exist in the past. For example, the artificial ‘bridge’ – well, a tunnel actually – between the UK and mainland Europe, and the true Øresund bridge (and tunnel…) between Denmark and Sweden. Organisms will exploit whatever means are present to extend their ranges and colonise new areas. Who now still believes that plants don’t move? ** But the connections considered in Land Bridges are not really bridges, in the sense of void-spanning structures. Rather, they are physical continuities of the land that is effectively a wall extending vertically upwards from the sea floor to break the ocean‘s surface and continuing skywards. In that way these land ‘bridges’ provide a pathway from one land-based location to another that can be traversed without getting your feet wet. Importantly, therefore, this so-called bridge not only facilitates exchange of living things between the connected land masses, but also – because of its undersea wall-like nature – restricts the distribution of marine organisms to either side of the bridge for as long as it remains a physical barrier to their free movement. Whilst that equally important property of land bridges is recognised by Graham, exploring this marine biogeographical consequence is something for another time (and another book..?). An enthralling book review, hats off!